VOL. I NO. 6 DELHI, THURSDAY OCTOBER 22, 1942. ON THE WAY BACK - Shot down after shooting up probably 20 trucks of Japs, Major Bruce K. Holloway of the China Air Task Force, is above shown heading back to his base on the back of a Chinese pony. On the morning of September 22nd I had been notified that I was to lead a flight of two airplanes along with another flight led by Major E. F. Rector to strafe a truck column reported moving along the Burma Road. The weather was not favorable for such a mission at that time and it was not till after noon that it was definitely decided on and the take-off made. The road we were to strafe was quickly located and we immediately started up this route looking for trucks. It didn't take long to find some. They were immediately attacked but due to the winding course of the road the trucks had to be picked off one at a time and the word traveled ahead very quickly. Further on all occupants had taken to the hills. Between Mangshih and the river bridge probably twenty trucks were destroyed. I saw seven either explode or burn. One truck upon which I made an attack exploded and in pulling out of the dive I went through the debris. One man was blown nearly fifty feet up the bank. Another truck started burning. The five occupants jumped clear but were cut down by my machine gun fire. Seeing a small encampment in the woods off the road I made a couple of passes, spraying it with all guns. I continued on up the road shooting at anything that looked like a worthy target. The ground fire was now operating from all points along the route and one or two guns scored hits on my plane, however I proceeded on to our prearranged rendezvous point without mishap. After circling two or three times and failing to see the other flight I decided to go back down the road and use the rest of my ammunition if any targets could be found. I hadn't gone far when I was surprised to see two trucks and a staff car, as I thought we had gotten everything along the route. I was able to hit the staff car before they could stop and take cover, annihilating it and the occupants - hope it contained high ranking officials. After hitting one of the trucks, I glanced back to see how my wing man was doing and saw the ricochets of his tracers going skyward but was unable to tell whether the shots were going home due to his being behind a hill. After I was working a wide turn about a mile and one half west of the road getting ready to make an attack on another truck I felt more ground fire hit the plane. It sounded very solid - like a 13mm, but since they had already hit me with no serious results the thought of trouble was quickly dismissed and my attention was concentrated on the truck upon which I was making the pass. UMMMmmmmmmmm!!! Oh, yes. She is Darleen Griffin who was elected the "Victory Venus" by the national Chiropractic Association in Los Angeles. Note the cup, please! from the Japs. My only chance lay in being able to reach the river and land in it, so I eased back to a slow cruising speed expecting each minute that the rods would come through the side of the engine or that it would catch on fire. By the grace of God, and a good Allison engine (the Major now says that speaking unfavorably of an Allison engine in his presence would be courting disaster as this one ran three minutes with no oil pressure, long enough to get over the Chinese lines and perhaps saved his life) I passed over the river and the engine was still running, so I headed over the mountain toward Paoshan. The oil temperature was steadily dropping, which indicated there was no flow of oil. Just as I reached the top of the ridge a couple of rods and main bearings let go and the engine began to vibrate convulsively. Had this lasted long, the plane would have been shaken to pieces but it was only a matter of seconds till the engine froze completely. 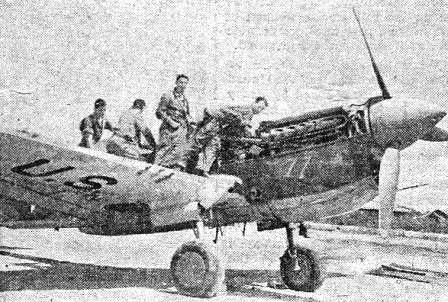 Major Edward F. Rector had led a flight of P-40s on a mission to strafe a truck column along the Burma Road. So intent was he on the full accomplishment of his mission that he failed to note the drift due to the high wind. When he knew he should be over the landing field he found himself still surrounded by heavy cloud banks and knew he was lost. His gas gauge registered 25 gallons. When the gas gauge read 12 gallons word had reached Colonel Robert L. Scott, his C.O. The colonel gave orders to radio the major to fly a course of ninety degrees. This was done and in ten minutes word was received that Major Rector was in the clear over a field, out of gas and that he was going to attempt a dead stick landing. This was done without mishap, the plane serviced and the Major returned home with his plane in perfect shape. Chungking - Fires that could be seen for 40 miles were started when bombers of the China Air Task Force recently attacked the Jap-held airdrome at Lashio, Burma. Numerous hits were scored in the southwest section of the town while seven bombs found their marks at the intersection of the runways on the sir field. There were no American losses. The Stilwell headquarters here also announced that during the September 27 raid on Mengshih, southwest Yunan, 27-30 trucks were destroyed and 400 Jap troops were killed. Hq. and Hq. Sq. of the Air Depot has one first sergeant who is not acting, and two non-first sergeants who are acting, one officially, the other by conscientious mandatory power - yes, I'm speaking of First Sgt. William O. Dixon, who is attached from Ordnance, Acting First Sgt. Madison M. Tomlinson (Tommy for short), and First Sgt. (Acting) Louis (e) J. Ryba - quite a triangle? It so happened that we received mail on the day they rationed out seven cans of beer to each man this past week-end, and in doing so, one Sgt. John C. Byrom, Jr., of some place named Waco, Texas (must be a little burg), happened to get one of those "not so good love letters" - and so help me, it was the first bender that he has been on since the night he slept in a ditch at Karachi. Corporal Johnny G. Arron (another Waco good-looker) was fishing in his "B" bag this morning - and the result was a tent full of visitors all day - yep, your right, it was a copy of the old "Police Gazette" - which incidentally, has been banned from the U.S. mails by the Postal authorities as "Indecent." Sgt. Shelby J. Tillotson, Jr. (the boy who claims that Coodys Bluff is a suburb of Nowata being a suburb of Coodys Bluff), is on the water wagon again - he gave his beer ration ticket to Sgt. "Snag" Carruthers who was so flushed for a drink - the fact being he was flushed due to drink. The Air Depot commanding officer, Lt. Col. John L. Des Islets, the incipient "bean shooter" of the outfit, is finding that he still has two competitors worth mentioning for honors, they being none other than S/Sgt. "Red" McHome and Pvt. "Guitar" Joe Mann - sure hope we can get the three together one of these days - even for a feud. - P.S. 1st Lt. William M. Schmiedel has been elected A-1 dog catcher. We don't have too much for this first contribution to the Roundup, but as we get a better idea of just what everybody wants we'll spread out accordingly. Sgts. Vernon Anderson, George Ansley, Mart Atkins, Oliver Bettes, Joyce Gilliam, Raymond C. Lee, and William Rooks are now Staffs. New three stripers - Fausty Bartolini, Wayne Dudgeon and Willie Shive. We've a lot of new Corporals too: Allen Bigelow, Francis Flannigan, Jesse Holmes, William Johnston, Marcus Martinsen and Albert Pereida are no longer rear-rankers. In the field of sports, your correspondents are prominent only in cribbage, casino and allied games. However, don't let that mislead you into thinking that the whole squadron is too lazy to get out and move around. Our softball team is ready to play any challenger - preferably in the States. Opposing team will furnish transportation. Challengers please contact Sgt. Shorty "Oolie" Oolovgian, our business manager. JUNIOR W.O. NOT HIGH ENOUGH FOR A KISS? There was plenty of excitement down at SOS the other day when a pretty Irish stenographer decided to keep her promise to a handsome Irish Tech. Sgt. It seems that she conceded to kiss him in the event that he received a fairly high promotion. Well it's turned out now that this Tech. Sgt. is now a Warrant Officer but as yet nothing has been done. The little Irish lassie is quite willing but the lad's contention is that the promotion was not a high one and therefore there is no promise to be kept. It couldn't be that he'd like to collect when no one is around? Or could it? HUMP-HOPPER - This is Capt. 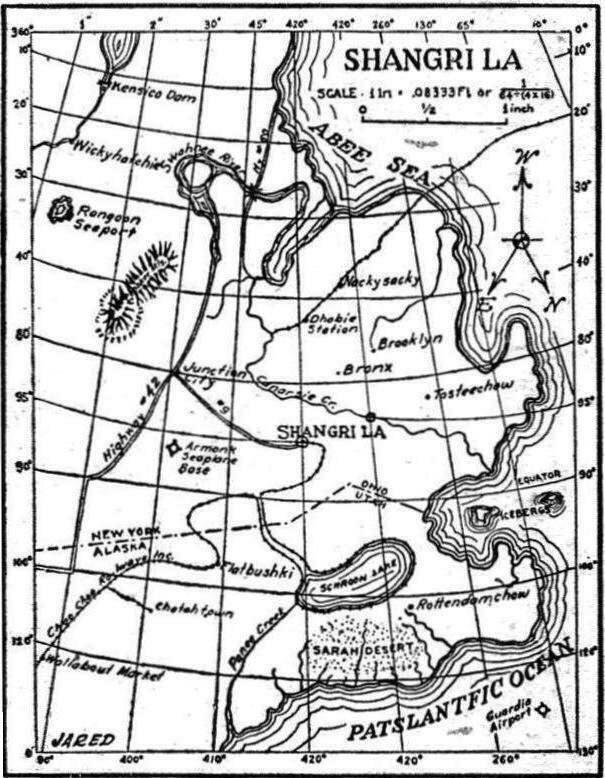 John Payne, the first pilot to ever fly over the "Hump" from India to China and back at night. Nowhere in India will you find pajamas as loud as those that adorn the shapely limbs of Sgt. Joe Storm and Sgt. Ware. Ware has a pair of the whitest of satin. Storm's are also satin but when he wears them he makes Ware look like he's in mourning. The bottom of Joe's are of robin's egg blue and the tops are of vivid yellow with an even more vivid brown design. Pvt. Russell B. Davis is down in the dumps again. His girlfriend is turning cool on him, for instead of the usual two letters a day, she is now writing only ten a week . . . The two female monkeys, Nancy and Betty, that keep Team No. Four in constant upheaval, are slowly but firmly being put in their places. Being the only women this side of God knows where, they have been pampered and petted until they nearly have everything their own way. After dumping a quart of iodine on Corp. John Perrys' bed, running up a thatch roof with a lighted candle, tearing all the bulletins off the board and performing a hundred-and-one cute but costly stunts, they are now tied several yards apart on very short leashes. This was accomplished only after twenty volunteers, armed with Tommies and tear gas, risked their lives and limbs. Eight of the above mentioned volunteers now lie at rest in the G.I. cemetery and the other twelve will be out of the hospital any day now . . .
Pfc. John Wolfe and Pfc. Carl Weinschenk are in hot water at home and I do mean hot. Each of them sent a poem home to their gals (at the suggestion of one Pvt. William Engle) and claimed that they had written it. The poem turned out to be the words to a current popular song! Besides that, the gals got together and compared notes. A Few Comments On The Happy-Hovel Construction Co. The boys up here in the green undergrowth country had a novel experience recently when they moved from tents out into a clearing and proceeded to watch the "Happy-Hovel Construction Company" literally build around them a flock of little grass shacks. Not to be confused with the song-famous variety of you-pronounce-it Hawaii, these hollow haystacks are pleasantly cool by day and fitted with - yes, electric lights, we should live so long. Said Pvt. Klyne Pearcy, "Now all we need is a sign 'All horses must be kept on a leash.'" Ho-hum note. Concluding portion of an American bomber pilot's report after a mission over Burma: "Right engine damaged by gunfire. Returned to base on one engine without incident." About incident enough for one day, don't y'think? Former Specialist 4th Class, then T/5 John McNeill, who says it took an Act of Congress to make him Corporal, is wearing his new glory in what he claims is the proper way. "You roll your sleeves up to where people can just see the two plasters, then for all they can tell you may have anything up to three up and three rockers." Stolid-visaged Gurkha troopers who were persuaded by jingling rupees to forego the ancient vendetta traditions and part with their famous "kukris" have been horrified to see Pvt. H. L. McLeland and some others desecrating the weapons. It seems the "throw-sight" notch in the blade is ideal for opening coke bottles. Exit tradition. One thing about China, it's a good place to take the "cure." Whiskey here costs about $75 American money per quart. Private "Gee Eye" would have to save for two months to throw one good one. Forces in China have a name for Chinese whiskey. It's called "Jing-bao" juice. "Jing-bao" stands for urgent alarm. Boy! What an alarm! Ask Cpl. Jack (Snoop) Askew. Over a "bull session" which included Sgt. J. Dodson, Pfc. Eddie Price, and your truly, we hit on an idea of what the ideal trip home would be like. We want a luxury liner with private staterooms, an immense soda fountain with cokes, malted milks, and plenty of ice cream. A bar stacked with our favorite brands and last but not least, a blonde for each and every one to dance with to Glen Miller in the Grand Salon. Oh Yea! It has been suggested by members of this command that Pvt. J. Ackerman be furnished a special mail bag to carry his mail. We think it might help speed up mail service. To my estimation, there are three main items that keep up the morale of the Army. Food, letters, and cigarettes. We have food and letters. Why doesn't some "Big-Wig" take action and keep the morale of the boys in China at 100 percent. The bottle-neck department (Air Corps Supply) is getting driving lessons from M/Sgt. John Cody. Their main trouble is keeping on the road. T/Sgt. E. Healy of radio team five has finally solved his razor blade problem. Regularly? His letters from home contain a dozen blades neatly pasted on a thin piece of cardboard. Ingenious, these Americans. Chaplain James Tull says being a captain doesn't feel any different from being a looey. "Let you know again around pay day," he adds. Chinese-American unity can be seen almost daily on the basketball court as members of SOS play against a team made up of Chinese soldiers in a pre-supper appetite raiser. These Chinese hoopsters may be small but, brother, they're fast.
" - think you must be pretty smart to have a qualified for foreign duty in such a few months . . "
So help me, it's true. With the rate of exchange running as high as forty-five "en" to one "gold" dollar, the boys literally have :money to burn." LEG ROUGE? - There's cheek rouge and lip rouge, so this new liquid leg make-up must be leg rouge. At any rate it takes the place of silk hose, according to Kay Bensel in the picture. What happens when it rains? But see how far you can go when you try to spend it. Boomtown in its heigh-day had nothing on wartime China. No one goes to town with less that a few hundred "en" if he expects to do anything but walk around (who feels like walking?) To drop a hint about as gently as slugging a guy with an axe: Now we took a few steps to open the Burma Road maybe - prices would drop about seventy-five percent. "Come on Joe, lets go to the N.C.O." has become a familiar phrase at this base during the past few months. Contrary to most N.C.O. 's, any member of U.S. forces is welcome at this particular non-coms club, from the lowliest buck private (now earning a minimum of $60.00 per) to the high and mighty generals. The N.C.O. Club came into being about four months ago when a few non-coms, seeing the need for such a recreational establishment, got together and started the ball rolling. The club was for non-coms only and dues of Rs. 10 per month were charged, but a few weeks after the opening of the club the doors were swung wide to everyone and dues were abolished. The local N.C.O. has as it's feature attraction an American style bar where anything from a Tom Collins (6 annas) to a Slow Roll Swizz," the Club's feature refresher, can be purchased. Good recordings are heard over a P.A. system and a restaurant is run by Indians in conjunction with the club. There is also a nicely equipped reading and writing room and two large porches where patrons may dine and wine if they prefer the wide open spaces. Crashing reverberations of breaking hearts bouncing around the barracks finally prompted two guys to do something about it. Two men, who evidently had tasted the bitter dregs of a broken romance, recently organized a club for jilted males. According to S/Sgt. George W. Lehman, with a bomber squadron at McPherson Barracks, and Corp. Henry Asher of a Q.M. Company, the Club for Brushed-Off Males meets a crying need of many men in foreign service. "Due to the fact that so many of the men over here in India have received letters, notes, telegrams, etc., from the girls whom they left behind telling them that 'they met someone else' of that 'a few years is too long to wait,' we felt that these fellows should have some company, for their moaning and weeping," they said. Membership in the Brush Offs Club is divided between Active Members and "The Just Sweating Member." TWO ROOKIES - Capt. 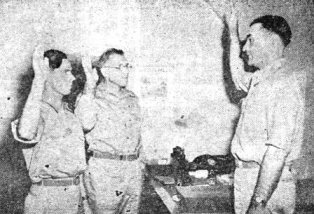 Vernon Slater, now down at the Chinese-American training camp, swears Donald G. Chase and Joseph Resnicsek into the Army. They enlisted in India. Requirements for active membership demand that all applicants have a broken heart (the more crushed and demolished - the better). In addition the prospective member should have that burning conviction the" She Done Him Wrong" and that he is a victim of "Fate and Circumstance." "Pending or Prospective Membership" is extended to "The Just Sweating" soldier. He is one who has not as yet received any confirmation of his being "left at the post," but in the back of his mind there is an idea that it will happen soon, if not before. Members will act as moral rejuvenators for each other, and will co-operate to obtain "Good Hunting" now that they are in the running again. Asher is the Brush Off President, Pvt. Francis McCrory, Vice President, Corp. John McConnell, "Chief Crier," Sgt. John Crow, "Chief Sweater," and Lt. Richard L. Weiss, "Sympathizer in Chief." Or do such things pass with time as weather? Will you have recalled, what things forgot forever? Who'll leave you to cry, in the night. Of girls he can make, like you. No place for yours truly to stay. For this one particular man. And washing with carbolic soap. Of iodine, quinine, et cet. That poor lying poets suggest. Oh Lord I want to go home. KEPT IN TRIM - The fighter planes of the China Air Task Force must be kept in perfect condition at all times, because they seem to be almost constantly in the air. Working on the ships are Sgt. Ramon Weiss, Corp. Edgar J. Pearson, M/Sgt. R. P. Rasmussen (formerly with the AVG), and Sgt. R. E. Dearnin. 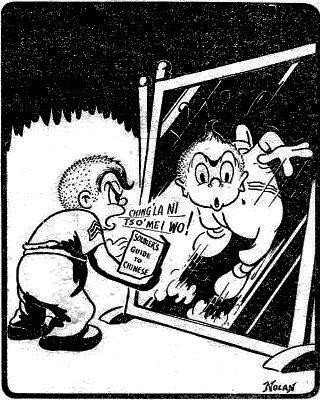 ONCE-OVER LIGHTLY - You don't need a barber chair nor a Police Gazette to get a rapid shave in India as Pfc. 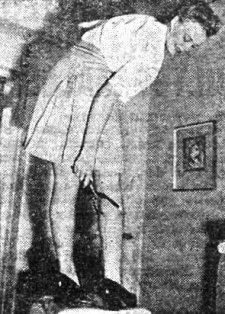 Edward Jankowski demonstrates. Maj. William F. Mullally, Air Force Chaplain, recently held the first Catholic Solemn High Evening Mass in India conducted by a U.S. Army chaplain. It is under a special dispensation granted by Pope Pius XII during the present war that enables Father Mullally and other Catholic chaplains in the CBI to say Mass in the afternoons or evenings for the Catholic men. With most soldiers working seven days a week, the new decree gives everyone the opportunity of fulfilling his religious obligations. IF YOU KNOW A STORY TOO . . . "IT'S PURELY COINCIDENTAL"
This concludes a series of coincidental meetings which could go on and on from man to man through the entire Army. Two Louisiana men, Sgt. 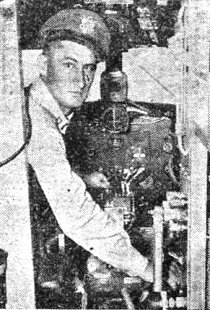 Vernon Smythe and Corp. Leland Gremillion worked together for Uncle Sam in the Construction Q.M. at Camp Claiborne - and not for 21 bucks per month either. They worked in the same office and so did the gal that Smythe finally married, but at that time the race was still on and Smythe's chief rival in this courtin' match was Gremillion's brother. SHANGRI-LA - James Hilton wrote a book called "Lost Horizon" in which he depicted a paradise of perpetual youth in a Tibetan monastery. Sgt. Jerry Jared herewith presents his own "Shangri-La" and it isn't in Tibet as you can plainly see. past more vividly. 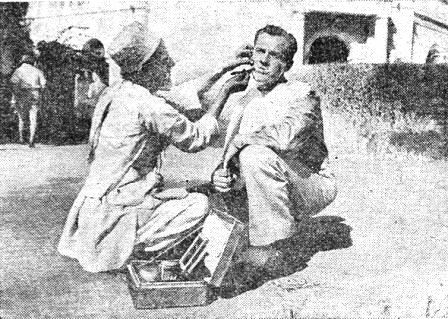 Smythe married the girl, and was inducted into the Army and landed in India with the first batch of G.I.'s. Months later Gremillion heard the Local Board's call, went through the usual pre-embarkation ceremonies, and arrived in India. They met here, and agreed that Gremillion's brother was a fine fellow after all. A year ago Lt. Bill Miller and Pvt. Joe Dickerson were dishing out haberdashery over the counters of Patterson-Fletcher in Fort Wayne, Indiana. Recently Dickerson was on night duty and the officer of the day walked in. Taking a gander at the officer, Joe mused, "No, it can't be," and then exclaimed, "Well I'll be a . . . if it ain't Bill Miller." To which Lt. Miller said, "You may be a . . . Joe, but that doesn't make it a bit cooler nor get us home any sooner." Pfc. Irving Fierman tells about making entries in the service record of a new arrival who, he discovered, came from his home town, Wilkes-Barre, Pa. Looking at the serial number of the newcomer, he was amazed to discover that it was just one before his. The new guy's name was Corp. Louie Ulanich and although both men enlisted the same day, they have been traveling in opposite directions ever since. Pvt. Tom Bynon was peddling cigarettes through Wyoming when he first met T/Sgt. Cecil Haines and Sgt. Elmer Brown in Rock Springs. Bynon's business took him to Fla., where he enlisted, and Haines and Brown joined out west. All traveled to India in the same convoy., but they didn't meet until they were all dickering for the services of an expert bearer. KEEP 'EM IN SHAPE - These three guys have the unromantic job of keeping the big DC-3's in the air. They are Cpl. Lewis Cohen, Cpl. 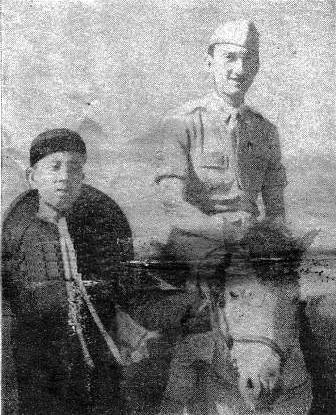 Joseph Andalics and Pfc. John Valkas. New Delhi Reveille - S/Sgt. Lester Nicholas ("Just call me Jesse") James claims that he is entitled to a service stripe with the letters C and Q inscribed on it. He just polished off a whole week as Charge of Quarters and tells how he has grown on the job: "What other C.Q. has learned to play Reveille on the bugle so that the soldiers can be awakened in a military manner? I'm not like these fly-by-night C.Q. 's who come and go. I take a real interest in my job." Confidentially, those who heard James' bugle calls heaved deep sighs of relief when his week was up. "English Spoken Here, American Understood" - "Hot toast, and make sure it's hot," ordered Corporal "Judge" Director at the India Coffee House. "Acha," said the Bearer. He was back in a short while with eight pieces of toast: "Ath toast," he explained. Director blew his "top." The toast was cold. Sick Bay - S/Sgt. Benny Schlender (AACS), who once boasted that he would never again have to do K.P. asserts that the hospital authorities have no respect for stripes. One of the nurses pulled her rank on him and put him on "spud fatigue." Sgt. Roy Myers, who has just quit the hospital after a 28-day incarceration, claims that it is much easier to get into than it is to get out. "When I finally did break loose," he laments, "I found all my closest friends had departed for other stations: Corp. Harry Munder, Sgt. Arthur Lake and S/Sgt. Erwin Andismann. But they were nice enough to leave Sgt. Orville Stratton behind to console me." Food for Thought - Worrying the boys in the Squadron is the regular attendance of the Mess-Manglers (Cook to you! ), Corp. Robert Dawson, S/Sgt. Chester Shea, and S/Sgt. William Bazzell at the India Coffee House. Says Shea: "The Coffee House has excellent cuisine." How about that? Stripe by Stripe -Grade by grade, William J. Callahan, Wendell P. Decker, Joseph P. Malinas, and Austin C. Sherrill march on toward higher rank as they become Staff Sergeants this week. Right on their heels are our two new Sergeants, John E. Smith and Jack I. Supman. Showing their true stripes for the first time are John B. Andrews, Paul G. Cohen, Paul T. Smith, and Einar Opsahl, now corporals. Gold braid, one stripe each, G.I. can now be issued to five new Pfc. 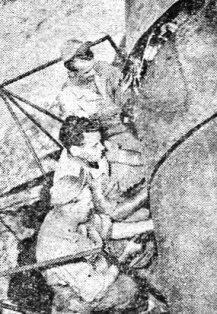 's, Charles A. Bachman, James G. Buckley, Louis E. Hall, Donald A. McCullum and Elliot F. Wylie. 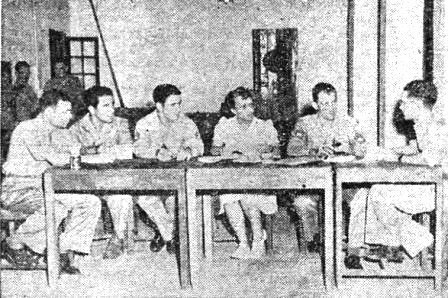 HALLOWE'EN SHOW - This is the committee handling the arrangements for a joint British-American Hallowe'en show. Left to right - Pvt. Aaron Schwartz, Tony Merendo, S/Sgt. Vincent Meehan, Miss Lois Nickerson (ARC), T/Sgt. Ken Harris and Corp. Jack Wright. Sounds in the night . . . the sharp report of a .45 - the result of my contemporary T/Sgt. James cleaning his automatic, trying to divert his attention between battling the breeze and cleaning the gun. It all happened at the end of the cleaning operation. After peering in the barrel to note the result of his labor T/Sgt. James calmly inserted the loaded clip, released the slide and picked out a point on the floor (fortunately there was only one floor) and pulled the trigger. His only reaction was to utter, "Well, I'll de damned," although he changed color many times during the ribbing ceremony as he began the job of recleaning his weapon . . . The booming voice of Sgt. Varney calling "Boy," in an effort to get some water to drink . . .
Sgt. Venti crashing to the floor after his bed had given way . . . Orchids to Chaplain Tull and the mechanics who finally placed the movie projector back in commission after several failures and burned out condensers . . . Scallions to the rogues who behaved themselves in such a manner that our city had to be temporarily placed "out of bounds" pending the arrival of more military police . . . Congrats to the officers recently promoted and to the newly arrived pilots and enlisted personnel. Bronislouse, whom I keep in my "C" bag, has been getting the low-down on what is in those letters from home that soldiers are so anxious to receive. Bronislouse says his methods are a military secret, but the following are samples of what the folks back home write to lift a soldier's morale. Private Jefferson "City-slicker" Ronk from the Blue Ridge Mountains of West Virginny gets his morale-lifters from Fleedybelle of Gobbler's Knob. She is 18 and is in the third grade. T/Sgt. Brodeen gets something from a beautiful red-head about a cow in Kentucky that ate the blue grass and mooed indigo. To which Bronislouse adds: "Peeyoo! Gas!!! Test for odor. Remove masks." A recently slenderized staff sergeant received a picture of Suzy from his girl Shirley. The boys in tent fourteen say the $64 question is "Who or what is Suzy?" Sergeant Bunny Bloom, who can slay women from 95 pounds to 231¾ (ask Hoekstra), hears from one of his many girls that her sister's boyfriend will be drafted even though he has only one eye. That's digging into the bag pretty deep. Sergeant Hall of the New England Halls received this in a letter: "The war news has been better the last two days. Keep up the good work." Yep. Yep. The C.B.I. boys are really pushing the little yellow men around. Corporal Slim Hoekstra and Sergeant Cy Wedger received letters from back home telling them how rugged life is in India. Hokie's gal thinks he is undernourished, ragged and barefooted. Hokie would be if we didn't have a good supply section. He wears size 14 shoes. Wedger has been lovingly told to take care of himself. Deah. Deah. Sergeant Kopp's friends are afraid of the censors, so they are writing down the newest dirty jokes to tell him when the war is over. Bronislouse suggests that the Sergeant demand a free beer with each joke. Bronislouse's prize find was the G.I. who received a package from home. It contained a tin of spam and several cans of Vienna sausages. How delicious! Some of the finest regiments in the Indian Army are Hindu, but more than half of the armed forces are drawn from the Moslem population. Moslems first came into India about a thousand years ago, and from time to time thereafter have poured through the mountain passes of the northwest. They settled in the parts they had conquered and made converts to their faith. Islam, the religion of the prophet Mohammed, is very different from Hinduism. Moslems believe in one god, Allah, and in the unity of God. They do not have idols and do not believe in caste. You will notice that when Moslems pray, as they do five times a day wherever they are, they bow in the direction of the holy city Mecca in Arabia. The service in mosques, their places of worship, consists mostly of reading from the Koran, their holy scripture. They worship in congregations in their mosques, not individually as Hindus do in their temples. In spite of all these differences, Hindus and Moslems have much in common. If they come from the same area, they will speak the same language, wear the same kind of clothes, eat about the same foods. Moslems do eat beef (although pork is forbidden) and do not have caste marks, but it is not easy to tell a Hindu from a Moslem at a glance. Moslems sometimes wear a round red hat called a fez, but it is usually easier to tell a man's home state rather than his religion by sizing up his appearance. There are about 89 million Moslems in India, nearly one-fourth the total population. The Sikhs are neither Hindu nor Moslem. They have their own religion which is like Hinduism in many ways but which believes in a single God who has been represented on earth by ten Sikh gurus or prophets. The five million Sikhs have a strong military tradition and are renowned for their bravery and war records. They really are a sort of military caste. In peacetime they are farmers, policemen, mechanics, as well as soldiers, but in time of war they crowd the recruiting stations. Sikhs are not supposed to cut their hair, and some of them braid their beards and hair up inside their turbans. The long hair is one of the five "K's." Sikhs should have their hair long (kesh), wear an iron bracelet on the right wrist (kara), wear short underpants (kachh), use a wooden comb (kanga), and carry an iron-handled knife (kirpan). Many Sikhs have the word "Singh" in their names. It means lion - and you'll find that they live up to this name. India is now divided politically into the provinces of British India and the Indian states. British India is ruled under the Governor-General (also called the Viceroy) who is appointed from London, and by legislative bodies elected by Indians. British India is by far the largest and most important part of the land, but you may often meet troops from an Indian state. Within a state the prince is absolute ruler. The British control all his foreign relations and may step in if the prince allows flagrant misgovernment of his state. 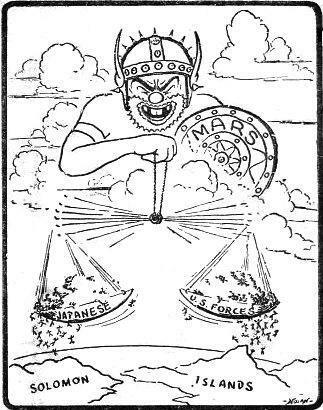 The larger princely states have their own armies, governments, police. Some even have their own customs, railways, coins and postage. It is as though Kentucky, Arkansas, Idaho, Rhode Island and a dozen other states of the Union were separate kingdoms subject to regulation from Washington only in foreign affairs and in times of emergency. The regiments of the native states have been trained under the supervision of British officers and are now an integral part of the Indian Army. Columbus was looking for an ocean way to India when he bumped into America. At first he thought that he was in India and called the people of the new land Indians. The Portuguese actually reached India a few years after the discovery of America; after them came the Dutch. When the French and British came along they defeated the Dutch and Portuguese and then fought it out between themselves for the control of India. The British won, and extended their rule until they had the whole country. Some territories were taken by force and the princes voluntarily allied themselves with Britain and pledged their allegiance to the King of England. These rulers continued to govern their lands, and their descendants are today the monarchs of the same states. There are 562 of these princely or native states, and together they make up two-fifths of the area and almost one-fourth the population of the country. They are scattered all over the land as you can see on a map. Some of the princes are Moslems, others are Hindus. The largest state, Hyderabad, has a population of 16,184,000 and is as big as Kansas. The smallest cover only a few square miles, less than an ordinary township.